That amatory season is not far from us. 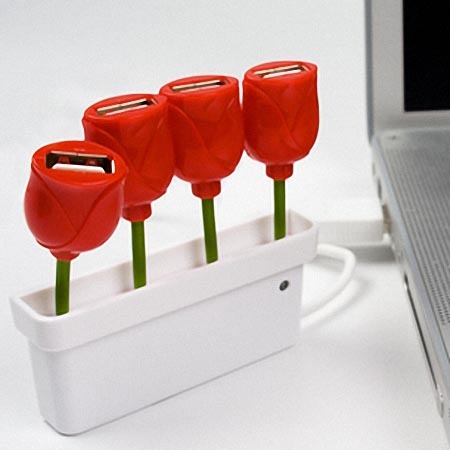 Even not roses, those red tulips also makes your room full of romance, what’s more, the tulip USB hub will never wither. Strictly speaking, this is a flower pot styled USB hub. There are four red tulips in the unique “pot”. Of course, all these are constructed of plastic. 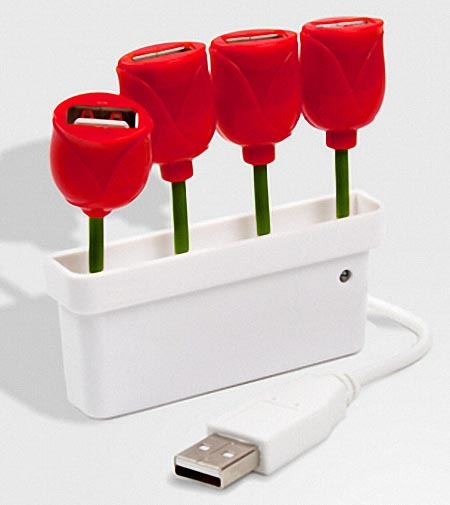 The four USB ports are respectively hidden in the tulips. The whole tulip USB hub measures 2.5 x 3 inches, and is compatible with most USB gadgets for all Mac and Windows operating systems. The tulip 4-port USB hub is priced at $22 USD. If you’re interested, jump to fred flare for more details. Additionally, if you need more options that match Valentines Day, you might like to check the flowerpot USB hub and more via “USB hub” tag.